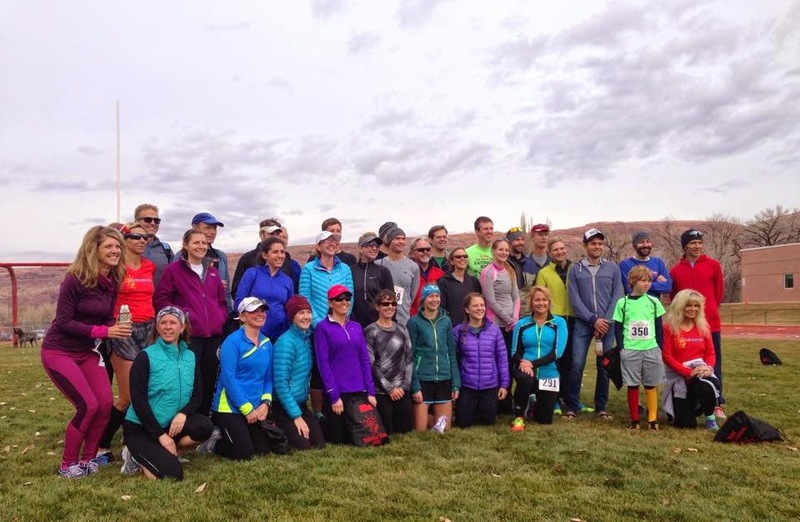 The Moab Winter Sun 10K just might be the perfect end-of-the-year race. It's a great size, an awesome course for a PR (even with the giant hill at mile 2), and they have tons of fun giveaways afterwards. Plus only living an hour and half from Moab now, makes it a perfect little getaway race for December. You may remember that I ran this race last year in what was freezing cold, snowy conditions. Even in those conditions, I still managed to run a PR by a long shot (previous PR was 56-something) and I ran this in 51:25. I was stoked and definitely planned to come back this year. Despite the fact that there was once again no sun again this year (maybe next year?? ), at-least the weather was MUCH warmer and without snow. The temperature was in the 40's, which is honestly perfect running weather. I rode down to Moab with some friends who I was also planning to stay the weekend with. After missing the I-70 turn off to Moab, and driving an extra 40+ miles, we made it with just enough time to check in at packet pick-up, get on the bus to the start, and then get in line for the bathrooms. Unfortunately, despite getting in line for the bathroom with 15 minutes to spare, the line was moving SO slow, and I just barely made it through with 2 minutes to spare. The only problem with this was that I had no time to warm-up. So I did a quick couple of strides before joining the masses getting ready to start. This race isn't chipped timed, so I wanted to make sure I started pretty close to the front for the most accurate time. The gun officially went off about a minute or two after 10:00am. I started off strong, but a little too fast, as I looked at my watch and was running a 6:00-something mile. I pulled back a little but tried to keep it strong. As I heard my watch beep for mile 1 and saw 7:29, I told myself, "There's no way I'll be able to hold this pace for 5 more miles." But I also wanted to keep running strong, as I knew there were 2 hills coming up including a really big one right after mile 2, and I wanted to bank some time since I knew I would slow during those. There was some significant downhill at the end of mile two, so I picked the pace up a little more. As mentioned above, right after you hit mile 2 is a pretty big uphill. I definitely slowed on this quite a bit, but told myself to just keep running strong. I also knew after this hill it was all downhill, which kept me motivated to run hard up the hill. After the hill is a gentle downhill again, so I was able to make up some time, and I was surprised to see I still managed another sub-8:00 mile. I was able to catch my breath and pick up my pace again during mile 4. There was a girl who looked like she could be in my age group that I was kind of leap frogging with. She had passed me around mile 2 and I passed her during mile 3. She passed me again. By mile 4, I was honestly in shock that I now had multiple miles under 7:30. My goal for this race was sub-50:00 which is an 8:02 pace. I've been doing speedwork and tempo runs for the last month, but still hadn't been running miles anywhere near 7:15-7:30 (technically my speedwork has me running this pace - but only for a lap or two around the track and then I recover before doing another - running this pace consistently is a whole other ballgame). During miles 5 & 6 I started to slow a little. I still knew I could finish strong, and by this point I knew I could for sure run sub-50:00, but I also knew I was getting tired! I kept at it and continued on. The course leaves the road and goes onto a paved bike path somewhere during this stretch. I tried to keep my pace up as much as I could. Right around the 6 mile mark, the course cuts across some grass on the way to the high school track. I got onto the track and picked my pace up as much as I could. I managed to pass the girl I had been leap frogging earlier again, and sprinted as much as I could for the last 300 meters where I then finished in 46:29. SO much faster than I ever thought I was capable of running! So overall, I really like this race (I think I said this same thing last year)! The few hills on the course give it some challenging terrain, but the overall net downhill allows you to really push yourself and run hard. I know I ran this race just about perfect - I finished feeling like I had truly given it everything I had, but also finished strong. I ran faster than I even thought capable - running at a faster per-mile pace than my current 5K PR! This race left me feeling SO much better and more confident about my goal to Boston Qualify next year. Despite running 5 minutes faster than I did last year, I ended up with the same age group placement - 5th. I tried not to be, given my huge PR, but I honestly was a little bummed about this. I was really hoping for a podium finish (definitely wasn't expecting 1st or anything - but I thought I could've at least gotten 3rd). However, looking at the awards, the next fastest girl in my age group ran 3+ minutes faster than me - so I honestly didn't even have a chance at an age group award. But, I've said it before and I'll say it again, since I clearly need the reminder - winning is really all about who shows up that day - seeing as I've placed in races where I've ran a lot slower than this! So maybe next year! After the race we hung around for the raffle, where I managed to win a gift card to Zak's (a really good local restaurant)! Then we all went to the Moab Brewery for lunch with a bunch of different folks from Grand Junction, before heading to our hotel to check-in. We stayed at the Best Western Plus in Moab, which is officially my favorite hotel in Moab now (except their in-season rates are over $200/night - so I probably won't be staying there anytime between March and October...). After checking-in, we went and explored Moonflower Canyon and a little bit of the Behind the Rocks area, before getting dinner and watching the Parade of Lights that night. On Sunday we had an awesome breakfast at the hotel and then went for a hike to Corona Arch before heading home. 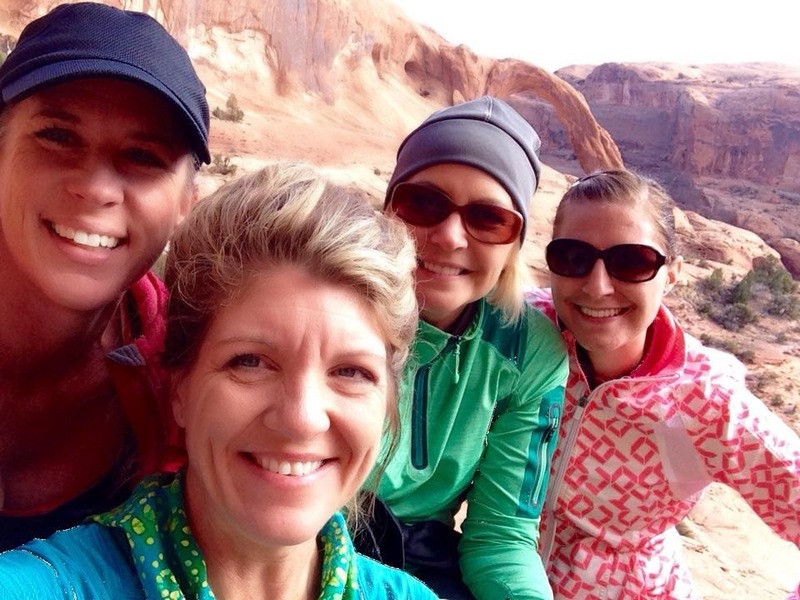 I loved this hike - it's about 3 miles and would be a perfect hike if I ever brought friends/family to Moab. While we were there, there was also a group of people repelling down from the arch, which was pretty cool to watch. No sun at the Winter Sun! This was the only picture I got with my bib. 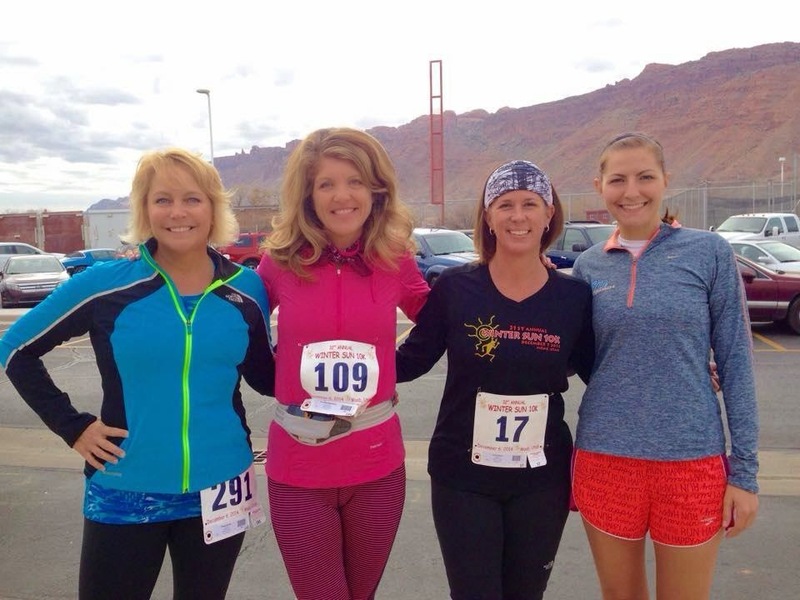 Me with Randee, Rochelle, and Jeni before the start! 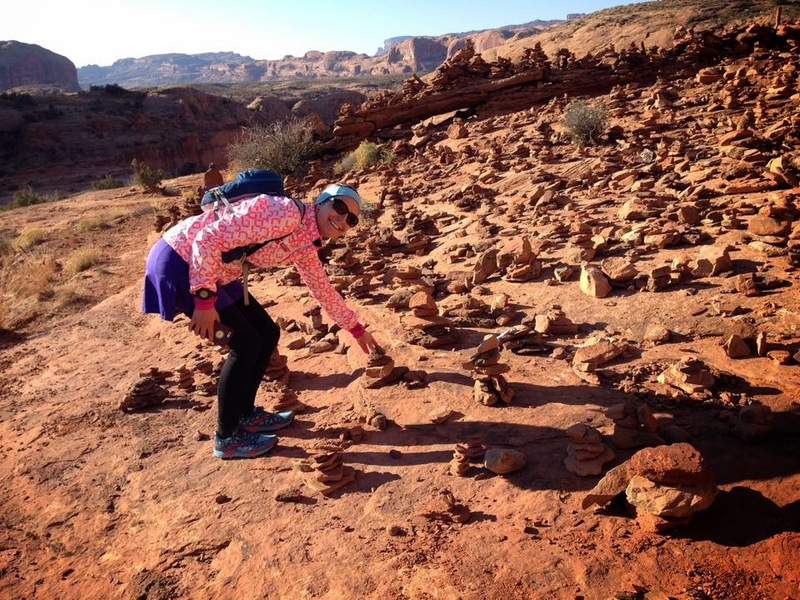 There's a section on the way to Corona Arch with tons of Cairns. It's tradition to add a rock when you hike this! Watching people repel down from the arch. Pretty cool!